Emilia’s Treasure: How a Mermaid makes Friends is a children’s adventure tale written by Anca Niculae and illustrated by Maria Falie. When a young mermaid, Emilia, decides to seek out friends who she can collect pearls with, she is met with scorn or fear, as the other sea creatures are busy with their own lives and do not wish to play. When Emilia chooses to gather the pearls on her own, she meets new sea creatures who are either distressed, singing, dancing or fleeing danger. Emilia learns that she has a special gift of listening to others and helping others in need, which makes her very special indeed. I very much enjoyed this delightful children’s book, filled with colorful illustrations throughout. Not only does it deal with those who are rather hostile, but also shows that sometimes you can make new friends just by listening and helping others who are in need. Anca Niculae’s tale of a mermaid who tries so hard to win the friendship of those around her, who are simply unsocial or mean is sad, but when Emilia starts encountering new people and goes out of her way to see what ails them and do what she can to help, she suddenly finds herself surrounded by friends who are genuine and who see the wonderful gifts that clearly shine from within Emilia. This not only makes the young mermaid appreciate her new friends, but also shows how wonderful her new friends truly are. The interactive questionnaire at the end of the book encourages young readers to look inside themselves for their own values and see what makes them special. 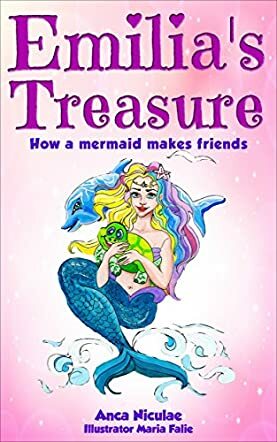 I very much enjoyed Emilia’s Treasure: How a Mermaid makes Friends, and recommend it to new readers aged 5-12 years of age so that they can discover how making friends should never be hard work; doing good deeds will earn you genuine friends in due time.